Fragile X syndrome is a common form of mental retardation caused by the absence of the FMR1 protein, FMRP. Fmr1 knockout mice exhibit a phenotype with some similarities to humans, such as macro-orchidism and behavioral abnormalities. Two homologs of FMRP have been identified, FXR1P and FXR2P. These proteins show high sequence similarity, including all functional domains identified in FMRP, such as RNA binding domains. They have an overlap in tissue distribution to that of FMRP. Interactions between the three FXR proteins have also been described. 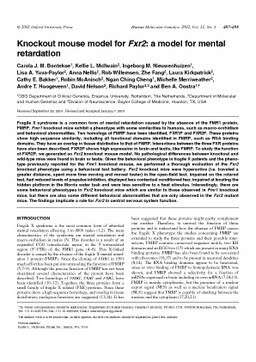 FXR2P shows high expression in brain and testis, like FMRP. To study the function of FXR2P, we generated an Fxr2 knockout mouse model. No pathological differences between knockout and wild-type mice were found in brain or testis. Given the behavioral phenotype in fragile X patients and the phenotype previously reported for the Fmr1 knockout mouse, we performed a thorough evaluation of the Fxr2 knockout phenotype using a behavioral test battery. Fxr2 knockout mice were hyperactive (i.e. traveled a greater distance, spent more time moving and moved faster) in the open-field test, impaired on the rotarod test, had reduced levels of prepulse inhibition, displayed less contextual conditioned fear, impaired at locating the hidden platform in the Morris water task and were less sensitive to a heat stimulus. Interestingly, there are some behavioral phenotypes in Fxr2 knockout mice which are similar to those observed in Fmr1 knockout mice, but there are also some different behavioral abnormalities that are only observed in the Fxr2 mutant mice. The findings implicate a role for Fxr2 in central nervous system function.